Docrates Cancer Center has two Varian Clinac iX linear accelerators for external radiotherapy, with integrated OBI® x-ray systems to enable cone beam computed tomography (CBCT). 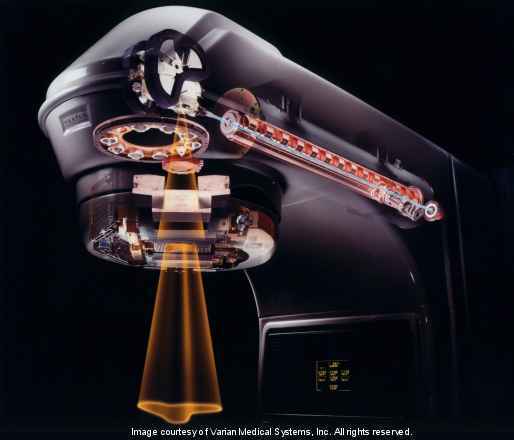 The linear accelerators produce electron and photon radiation. The radiation is delivered precisely to the target in the patient’s body, in accordance with a 3D dose plan prepared in advance. Photon radiation has more uses than electron radiation, due to its higher penetration capacity. Photon radiation is called high-energy x-radiation. The mechanism by which it is generated resembles the traditional x-ray tube. The electrons are detached by heating them in an electron gun and then pulled into the accelerator tube using high voltage. The klystron produces a microwave field which accelerates the electrons to almost the speed of light in a 2?metre?long horizontal tube. The high-energy electro beam, approximately 1 millimetre in width, is bent 270 degrees downwards using magnets to be aimed at a heavy metal target. As the electrons interact with the target, their energy decreases, creating deceleration radiation (x-rays or photon radiation) with an average energy of 6 MeV or 15 MeV according to choice. The photon radiation dose rate in the centre of the radiation beam is 2–8 Gy/min. (typically 4 Gy/min., the dose rates vary in the VMAT RapidArc technique). The patient receives electron radiation when the heavy metal target is removed. The dose rate can then be up to 10 Gy/min. The treatment energies of the electron beams vary from 4 to 16 MeV. Narrow electron beams and decentralised photon beams cannot be targeted at the patient until they have been smoothed. The electron beam is spread using scattering foil and restricted using both the electron applicators attached to the end of the accelerator and the electron shielding cast according to the shape of the target (lead, Wood’s metal). The photon beam is first adjusted using a smoothing filter and then roughly focused using x- and y-dimension beam limiting devices. The photon beam is finally limited at millimetre accuracy using the multileaf collimator. The monitoring or ionisation chamber fixed in the radiation beam is used to monitor the dose rate of the device as well as the dose and beam symmetry. The therapeutic doses are measured out in monitor units (MU, 100 MU = 1 Gy) in accordance with the monitoring chamber. The operations of the monitoring chamber are regularly monitored by conducting measurements using different ionisation and semiconductor detectors.